What kind of education is possible in war zones? What kind of teachers work there? What kind of school can you build? What kinds of resources can you have in the classroom? What can education do for conflict-affected communities who still lack secure access to water, food, stability? I've always believed education is powerful. Maybe it started as I watched my parents move heaven and earth to get my siblings and me into good schools - or perhaps even earlier when my mum taught me to recognise letters and numbers. My neighbourhood friends and I all received free school meals, but went to different schools, and as time passed the gap between us widened: I made it to university then into employment without a hitch, whilst my neighbours didn't, spending time behind bars before they even finished school. I grew up on stories of how education transformed my mother’s life, growing up in post-war Korea. As I grew up and started working I came to see that education opened doors and gave me hope. After studying, I went back to work to teach in neighborhoods like the one I grew up in with Teach First (a charity that trains and sends teachers into disadvantaged neighborhoods in England and Wales), determined that children who ended up in the schools my parents helped me avoid should have access to a quality education - one that was on a par with what I received. Teaching, and later working, to support teachers across schools serving disadvantaged communities made me think that these children needed the best teachers. In fact, these children may need better teachers than their more privileged peers. But what about children who don't have access to education? According to UNICEF there are over 200 million children out-of-school in the world. First of all, they need access to education, but what if they could access the best education that we know how to provide? And what about children affected by war? They are the least likely to access education and the most difficult to reach. Arguably, they need it most of all. 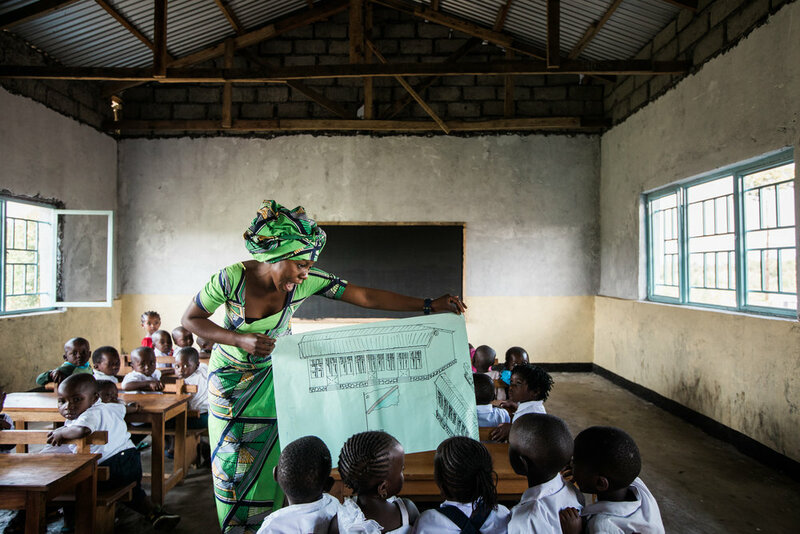 In eastern DRC, where Justice Rising works, we believe that education can transform war zones. Our teachers are high-school graduates and we believe they can be supported to teach really well. Our schools are safe spaces where powerful change happens as our children learn to read, to count, about the world they live in, and the languages they speak. We believe the teacher is the greatest resource in the classroom – that with our support they can birth hope and equip our students with powerful knowledge. So we build peace in our teachers so they can become peacebuilders. We believe that by providing education to communities affected by conflict, we can equip the community to withstand war and build peace. In ONE week we launch our 2019 Expand Campaign to better serve populations living in war. Partner with us to expand our work both in depth and reach so we can see a generation of children equipped to build peace in Congo. Following her studies in Law at the University of Manchester, Ee-Reh gained a Masters in International Politics and Security Studies at the Peace Studies Department at the University of Bradford. She then joined the Leadership Development Programme at Teach First, working as a primary school teacher then working as a teacher trainer with Teach First. She then went to mission school in Mozambique before supporting a school in Liberia post-Ebola in 2016. Ee-Reh led Justice Rising's Teacher Training in 2017 before joining Justice Rising as Schools Director in August 2018.